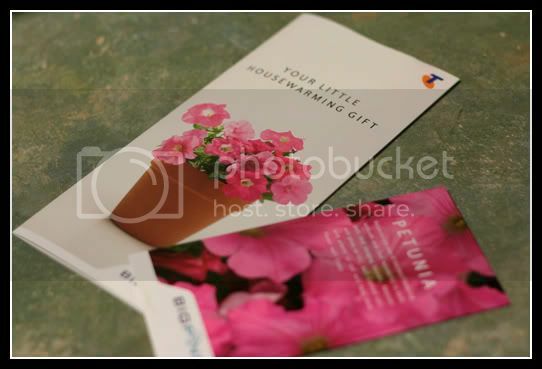 to offer you a pot plant by way of a housewarming gift. so we've sent you the seeds instead. It's just our way of saying welcome. It's inexpensive and very imaginative. Even the copy sounds so personal and thoughtful. Yeah they are awesome until you want to take your address off the list, and then you call up (the only way) to remove it, and they bounce you from menu to menu and then this person will answer and say "oh you will need to go from this menu to remove" and bounce you back to something you were at like 15 minutes ago. The petunia looks lovely! *-* Can't wait to see them seeds grow up all healthy and start blossoming!